For some of us, the idea of a digital piano takes us back in the day to those old keyboards that were more toys than actual instruments. It was only a matter time before one or two (or several) of those keys would eventually give up the fight and just stop working. They were nowhere near the quality and feel of an acoustic piano and in no way could be considered an actual replacement for one. In the last few years, however, the best digital pianos have come a long way and are now a serious alternative to acoustic pianos. Keyboards are generally cheaper and their relatively compact size can fit most spaces. They also don’t require the pricey maintenance that comes with owning an acoustic piano. But how close are they to the real thing? Pretty close. Take Yamaha for example. The Yamaha Corporation has been around since 1887 and has become one of the most recognized brands in the world. They offer a vast array of products ranging from musical instruments to small vehicles. Yamaha’s products are the embodiment of their vision of giving buyers the experience of absolute quality and performance. Yamaha’s digital pianos are highly-regarded for their sound quality. A few years ago, Yamaha introduced the Pure CF sound engine, which features sound samples taken from what Yamaha calls their “crowning glory”—the CFIIIS 9-foot concert grand piano. Another outstanding Yamaha technology is Graded Hammer Action. In keyboards with this technology, the keys emulate the touch response of an acoustic piano with a heavier action on the lower keys and a lighter action on the higher keys. Graded Hammer Standard (GHS) is suited to a beginner level of playing, and provides a weighted effect to develop the technique needed for an acoustic piano. Graded Hammer Effect (GH/GHE) is for intermediate and advanced players who are playing more complicated musical pieces that require repeatedly hitting the same note. Grade Hammer Effect 3 (GH3) is similar to GH/GHE, but has a shorter swing-back time to further mimic a high-quality acoustic piano. So if you’re buying a digital piano, it only makes sense to buy a Yamaha. But what is the bestYamaha digital piano for you? This Yamaha digital piano review covers the best options for each need. 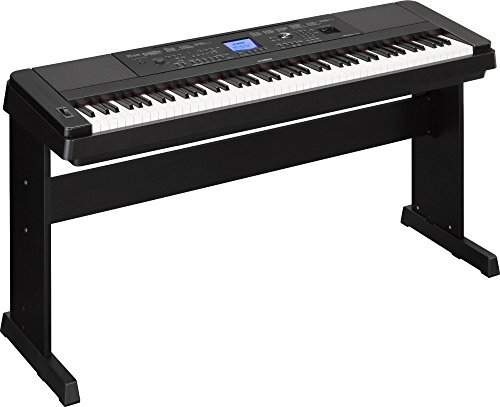 The Yamaha P-115 is the bestseller of the P-series. It’s a full 88-key keyboard that’s fairly straightforward, making it very user-friendly and features a sleek and compact design. It includes both the GHS weighted action and the Pure CF sound engine that you can enjoy through the four internal speakers. The P-115 also boasts a polyphony number of 192, something that experienced players mightfind particularly interesting. Polyphony number indicates the number of notes you can play at the same time, so the higher a keyboard’s polyphony number the longer you can sustain notes and the richer the outcome of the sound. There are 14 different voices and a good number of rhythms on this keyboard and it allows you to record what you play, a handy feature for songwriting. Additionally, you can also download Yamaha’s app “Digital Piano Controller” which allows you to control your keyboard from an iOS device. 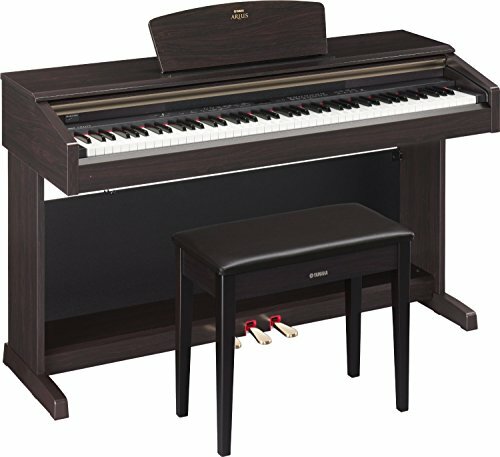 Overall, this is a solid instrument and the best Yamaha piano for those who just want to play the piano. You’d be hard-pressed to find another keyboard of better quality within the same price range as the P-115. But if you’re looking for a digital piano that comes with all the bells andwhistles this keyboard probably isn’t it. Where the P-115 is straightforward, the Yamaha DGX660 is the winner in versatility. It shares the same features as the P-115: full 88-key keyboard, GHS weighted action, and Pure CF sound engine. The Piano Room is a new feature that enables you to create a unique piano environment by selecting from an array of piano and acoustic settings. The keyboard also features a score and lyric display that lets you play while following notation for any MIDI song. You can download MIDI files from Yamaha MusicSoft to use on your keyboard. A microphone may be connected to the keyboard so you can sing along while you play and apply different digital effects to your voice. If you want to show off your performances, you can even record on a USB device. You can also wirelessly connect an iOS device to stream your audio or MIDI on the DGX660. The DGX660 is the best Yamaha keyboard if you’re looking for something to entertain with. The variety of uses and interactions are great fun for anyone who likes to put on a performance with friends and family. The Yamaha P-45 is a stripped down version of the P-115, and is the most affordable Yamaha keyboard. Both have full keyboards with GHS weighted action, and both are very compact. However, the P-45 does not come with the Pure CF sound engine and instead comes with the older Yamaha technology AWM (Advanced Wave Memory) Stereo Sampling, which still gives great sound quality. It also has a lower polyphony number at 64, and has ten different voices to choose from. If you’re a beginner or you’re on a budget, the P-45 is probably your best bet. The Yamaha P-255 is on the opposite side of the spectrum from the P-45. Think of it as the P-115 on steroids. With a full keyboard and Pure CF sound engine, the P-255 has GH weighted action and is better suited for intermediate or advanced players. Like its P-series siblings, this digital piano is elegantly designed. It doesn’t overwhelm with buttons and switches and keeps it very simple and classy. It also comes with a sustain pedal. The P-255 keyboard comes with an impressive polyphony number of 256, giving it a fuller sound. The voice package offers 24 different options, a clear jump from P-115’s 14 voices. To top this off, the P-255 features Yamaha’s Key Off Samples that mimic the same sound that a grand piano creates when lifting your fingers from the keys. You can appreciate all these wonderful details through its two 15-watt speakers. The P-255 is definitely the best option for intermediate to advanced players who are looking for a digital piano that is as close to an authentic acoustic piano experience as possible. The one drawback for some may be the hefty price tag attached to this model. The Yamaha Arius YDP-181 is the oldest model on the list, but there’s a reason why it’s here. Yamaha touts its Arius line of console digital pianos as a combination of beautiful wood cabinetry and their trademark piano craftsmanship. The YDP-181 doesn’t disappoint in the least with itsgorgeous dark wood finish and gold fittings. It features a 3-pedal unit also in gleaming gold. As a piano, the YDP-181 as a full keyboard with AWM Stereo Sampling and GH weighted action. It has a polyphony number of 128 and a voice package of 14. The keyboard features variable touch sensitivity, allowing the player to choose from hard, medium or soft. The YDP-181 has damper resonance coupled with half-pedal control to help create beautifully rich tones. It also comes with 50 preset songs for you to enjoy or you can record your own song using the keyboard’s song recorder. One drawback is the lack of tweeters in the built-in speakers. Some owners of the YDP-181 have complained that the sound quality is somewhat compromised because of this. Is the YDP-181 the right Yamaha digital piano for you? If you’re looking for a keyboard that has both the look and feel of an acoustic piano then the answer is yes. The YDP-181 is definitely a beautiful addition to anyone’s home. In the end, there isn’t one best Yamaha digital piano—all of them are great. It’s up to you to determine which model fits your needs and wants the best. If you’re a beginner, you’re going to have different needs than a professional. If you want to record, you’re going to need a different keyboard than someone who just wants to play classical pieces. Yamaha has a digital piano to fit every need, and no matter which one ends up being the best fit for you, it’s definitely going to be a good purchase.